4/21/2018--- I found the card that zodiac got his idea from. I am not going to post it...yet....but it has something on it hand drawn that zodiac also hand drew on something he made and it is exact in everyway. It is not a zodiac symbol. 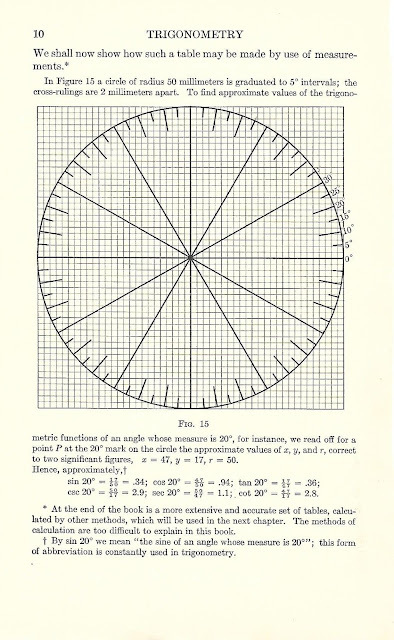 ..This card was created by the most famous cryptographer in American history. The link www.zodiackillerenigma.com may be changing in the future. I am going to be posting alternative links. All will bring you to the same place. When I first created this page I wasan't thinking about links and domain names and I created a domain that was hard to remember. So rather than creating a whole new site and moving everything I created these to make the site easier to find and easier to remember. The domain www.zodiackillerenigma.com may be changing in the future. I am not sure yet but any of the links listed above will bring you to this site. For now the address below will work but if a time comes when it doesn't remember one of the other addresses listed above. The change will cause chaos for a little while but after about a year all of it will work itself out. I am always working on this site. I want something that will always be here even if I am not. "This is a game of misdirection. Here is a short preview to get you started.I hope it gets you curious to read more. 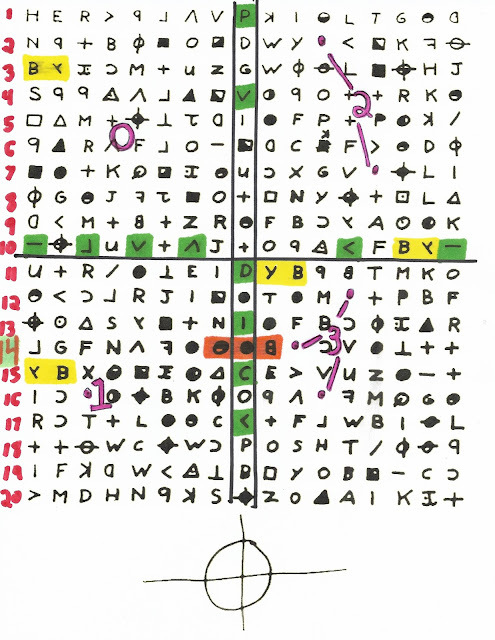 I don't think the 340 cipher is a cipher.I think it is a grid.. A grid that can be used with the Phillips 66 map sent by the Zodiac killer to reveal hidden locations and the Radians he mentioned that we should look for in his letters. This page explains everything in the best detail I could supply. The 340 could still have more hidden secrets in fact I would bet on it and I am still looking for them, I Hope you enjoy this. If you do give me a like or a +1. For you beginners more will be explained. A hidden message can be found in the 340. Here is the message I found hidden in the 340. To see how I found this and what the context of the message means you will have to read sections 1 though 8 and the murder of Susan Nason. I start the animation by proving the scale of the documents. I still think the 340 holds more secrets. This doesn't mean that the 340 still couldn't have more hidden secrets or messages, but you will see more on all of this. These are here in an effort to get you curious and hopefully read more. Here is a preview of one of the bomb drawings matching the map when the timer and compass are aligned and overlayed. 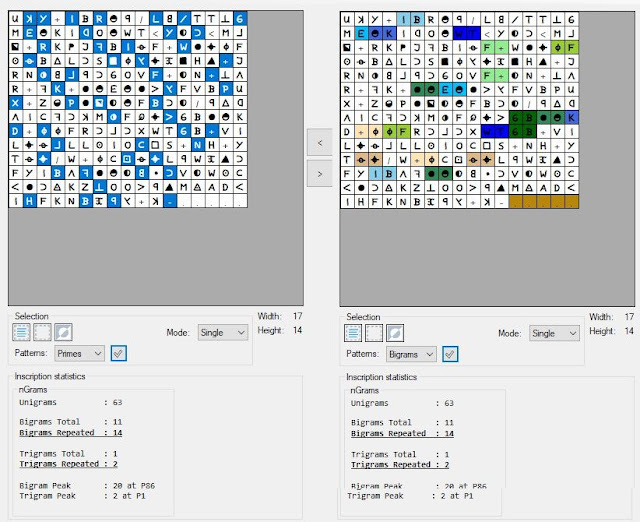 This is called "MASKING" or visual cryptography. Map overlaying is a veru common thing and and to this very day even some of the map apps you use on your phone have overlaying options. I started it by putting the proof of scale of each document side by side. In my opinion this is the most important discovery I made and one that people pay the least amount of atterntion to. 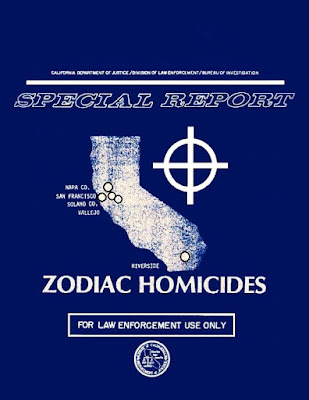 It proves Zodiac was using overlay. He even had to use a grid overlay just to create the 340 code. It marks a couple of locations but more importantly it marks a section of highway witrh a string of bomb. While I do not think there are bombs on this section of highway I do wonder what the imprtance of it is. You will find out what I could find out so far. These are just a previews to what I have found. That is basically the short and skinny of it all. Does any of that look complicated? You just put one thing over the other ...you "COUPLE" then to make one. Nothing complicated about it. What it all means could be open to interpretation. I have done my best to show what I think it all means but I could have missed things or even interpreted it wrong. The rest of my site is dedicated to trying to understand it all and prove what I have found. That being said you might see something different or find something I missed. What is important is that I have proved overlaying masking plays a role in these codes. To find out what I know you will just have to read my articles and if you see something important I missed please inform me. If I think is is valid I will post it and credit you with the find. I am just one man, but together anything is possible. I don't know it all. I don't know everything. My hope is that this will be seen by eyes who can help or know things I do not, or that someone wil have that spark of inspiration and see something I didn't. What you have just seen in the cryptography world is called overlay masking ,and it has been used for a very long time. It was very popular in the American Revolutionary War and even in times much much older. I show some examples in the different sections below. I even have one example that was used in the American Civil War. It is a type of visual cryptography. 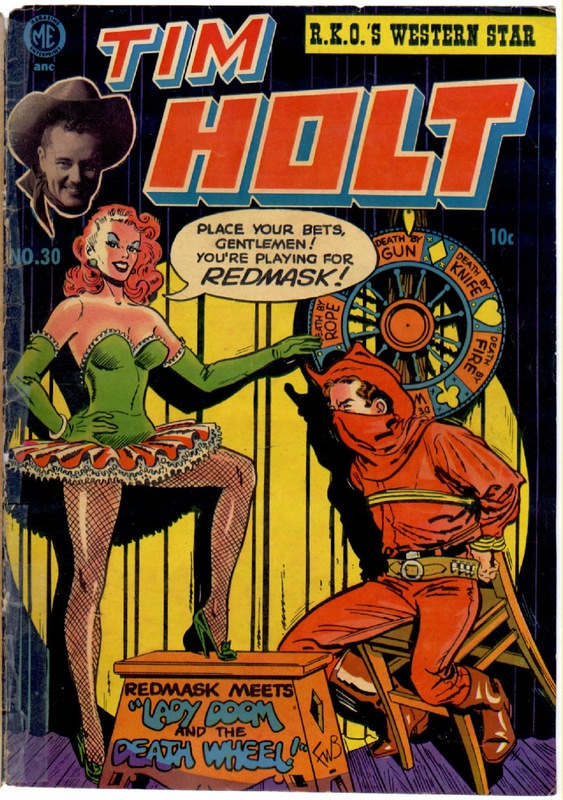 One of my missions is to find the best and many different examples of known Masking codes and overlay uses to illustrate how and why these were used and that is was an actual real thing. 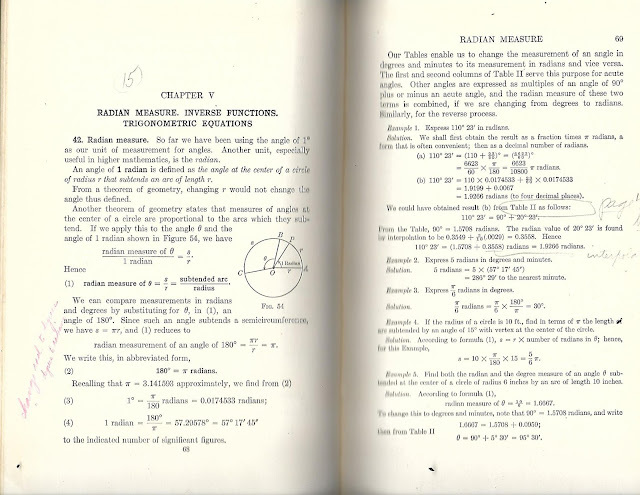 I was taught about this stuff when I was a kid in elementary school.I hope to find the text book in the future I first learned about it from. 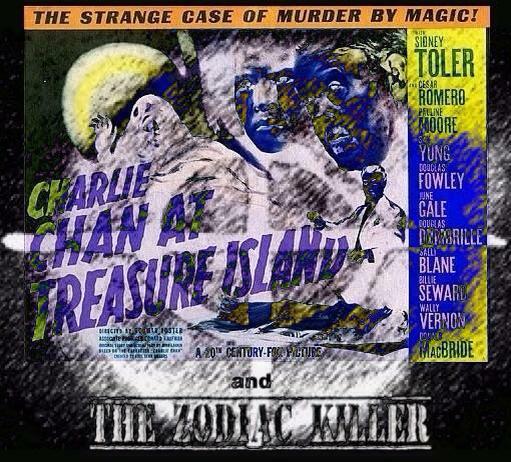 I may even run across where Zodiac learned about it, though I suspect he may have learned it in the same way I did. 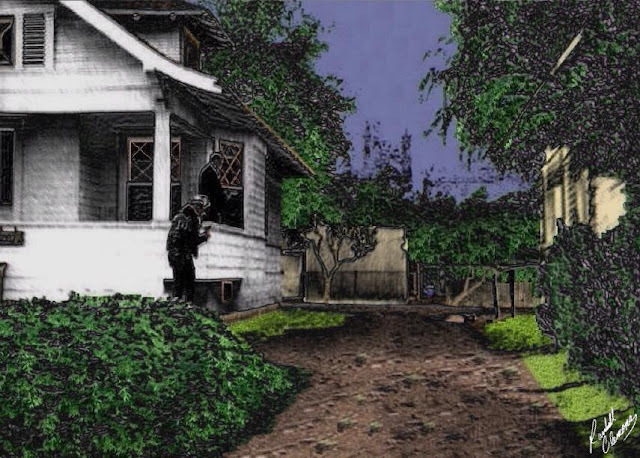 Below is an example of overlaying two images to reveal a message. The type of overlay is really only limited by the creators imagination. It also shows is was an actual thing. What makes an overlay so great is that it can not be solved unless you have all of the pieces. I am sure most of you have seen something similar to the example below when you were kids with toys in a happy meal , magic tricks, or something of that nature. I know I have. This is just here to make you think. I have never tried to make or explain anything like this before. I worry about that because I am not a writer. When I first started this I didn't think it was going to be so much work. Now I realize I will never truly be finished. Sometimes I worry if I did a good job or if people will take something I said the wrong way and judge me harshly. I also worry I might take something someone else says the wrong way. I worry I might say the wrong thing. I try to paint a picture with my words, but sometimes I struggle in putting them down the right way. So I made lots of pictures and animated examples. It is easier for me to show you than it is to explain it I worry sometimes that maybe I threw too much out there at once , but I just put it down as it came to me. From time to time I will keep working on this. Writing, rewording, and organization. In the future I hope to do a smaller posts that just shows the process. I have a new video for that , but I am afraid to put it up. I worry that I bother people with this and I apologize if I did aggravate anyone. I guess sometimes I worry too much. Even though I worry about these things, I am still 100 percent confident in my work. When I first did this people said ,"he is not showing his process and work .He didn't show the scale and its seems to simple". Then I redid everything showing every little detail and explanation. Then the same people said, "It seems to complicated and confusing. It is way to complicated to have any validity and looks forced together". Then I realized I am not going to please those people no matter what I do so I am not going to try. I have posts with all the details and I have simple posts. So if someone gets confused you can look at a simple post "which you saw above" and if someone wants more detail, proof, and explanation I have that also. As you have seen above there is nothing complicated to it. You just put two documnets over each other to create one. I also show examples of this very same thing being done in history. When I first started this there was not a lot on the subject on the internet. There was some but not alot. Now more is being added everyday all over the world. You will see a lot more about it as you read. I am just doing this to show the people that want to see but I do hope you enjoy it and find it interesting. I also hope others use this and do work of thier own. You might see something different than what I saw and I am only one man. I can only do so much. While I don't really want a lot of attention for msyelf I do want what I have done to get attention. I want people to read it and if they see something different in it than what I saw or see something I didn't see ..then go for it. It wouold be nice though if you gave me a mention and remember where it all started. I was conflicted at first on whether I should share this or not because I have seen the way others have been attacked. In the end I decided it does no one any good if I keep it to myself and if someone doesn't agree then they don't have to read it. It would have bothered me more if I had done nothing. If you disagree with one part that doesn't mean you shouldn't pay attention to other parts. I am just a guy...a person like you. There is nothing special about me. I can make mistakes just like anyone else. That doesn't mean you shouldn't pay attention to what I have done. I hope some enjoy just reading it while I honeslty hope it helps others solve the mystery. 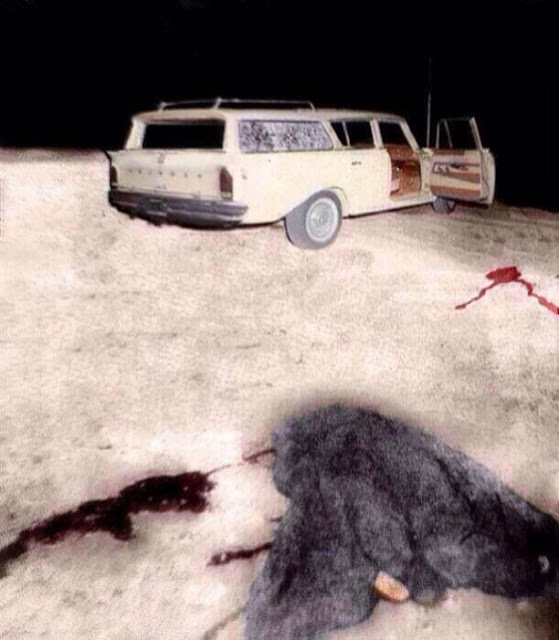 Along with my work I have restored and colorized a lot of the old photos...including crime scene and autopsy photos so be warned. I don't think it is in bad taste. I think it helps to remind people this was a real thing...it happened ..and when they see the photos they know it. It also helped me to examine them in every detail for clues. 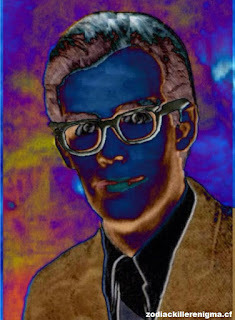 Richard Grinell of Zodiac ciphers . com also helped with that project. Again if someone does not like that they do not have to look at them. If you look at them it is because you want to and not because someone made you. Some of them are very graphic and again it reminds people of the reality of it when they see it in color. I researched the Zodiac Codes and letters for a few years. Then I made some discoveries and decided to move my work online to share it with others. Think of this as my online notebook. Over time it keeps growing as I do more research and make more discoveries. I believe I have made some important breakthroughs in the codes and made some important discoveries. This page was the main body of work , but as it grew I was forced to break the main body down into 8 sections which are listed below and turn this into a main title page or site map. There is a lot of information and animations here and I am very good at what I do. Breaking it down makes it easier for anyone who wants to read them and to load the pages. It also makes it easier for me to update specific sections as I make more discovieries (and I do all the time). Below are the 8 main important sections. There are other posts that are based from information in these sections. As time goes by and I do more research this will continue to grow. Here are the first main important sections. Click on the links below to read each section. Each section is linked with the section that follows at the end of each page. Here is a short video of Zodiac related images I turned from black and white to color. This is a small video file. I have one of netter quality I will put up later , but it is a much larger file. 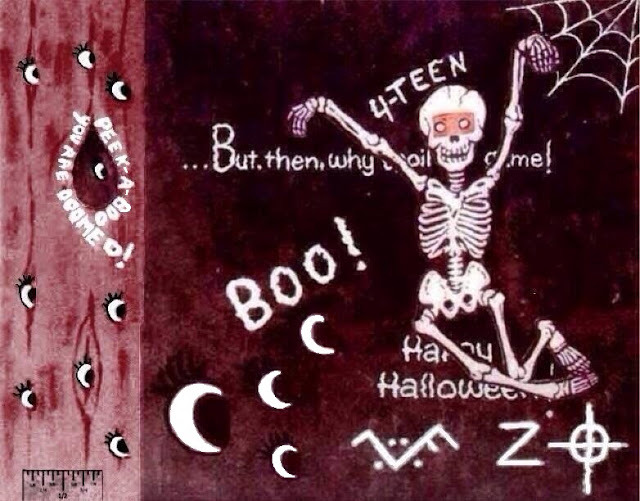 Pay attention to the "4-teen" and "Boo"
On the 14th line you can find the word "Boo". Also notice how one of the "N's" in the word "knife" is written backwords in the image above. Clues, Clues, Clues, but to what? Keep reading. Examples of Map and Grid Overlays Used by the Government, Military, and other sources. This section backs up and shows map overlaying, in historical and modern times. I add new things all the time. 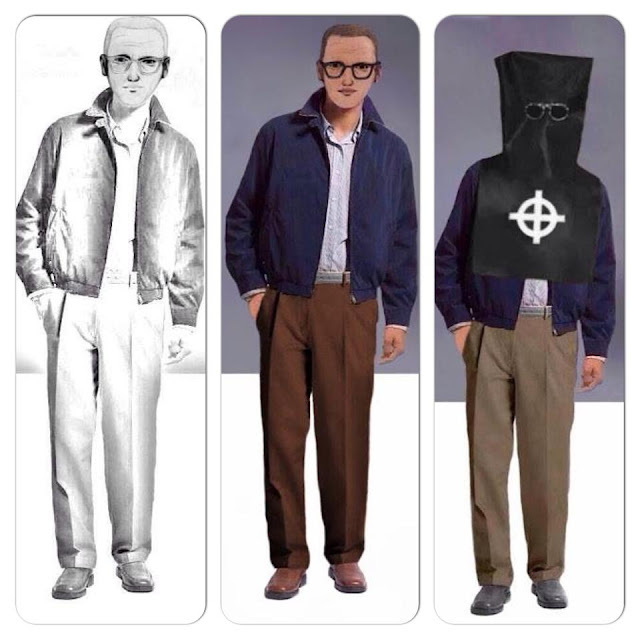 The Zodiac Killer Letters and Codes. 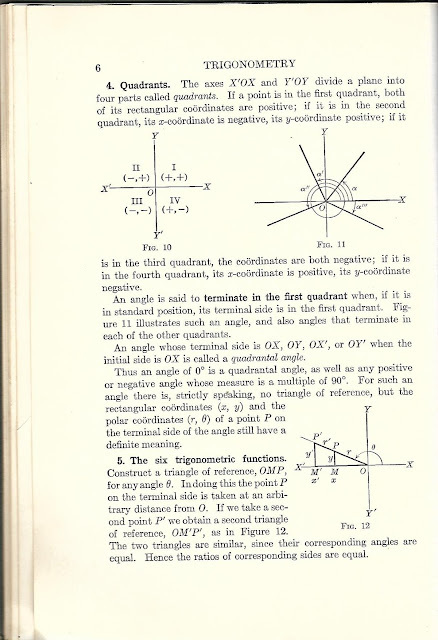 Here I have posted the best examples of the letters and codes I can find and I am in the process of providing proof of scale for the documents that do not have them for future experiments. I am working on this project for future experiments. I believe the eyes on the Halloween Card could be an overlay mask for finding a hidden message. Overlaying in cryptography is called "Masking". 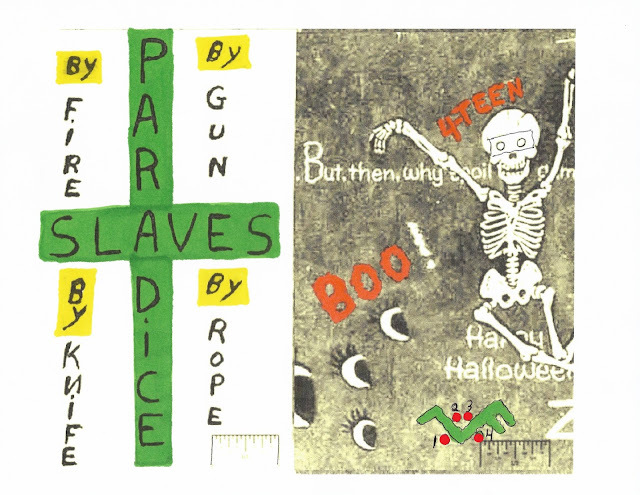 Note on the Halloween Card the skeleton is wearing a mask over his eyes. I believe that to be a clue left by the Zodiac. 4/24/2018 - 1967 Army training video showing map overlays, grid, and prepared overlays. 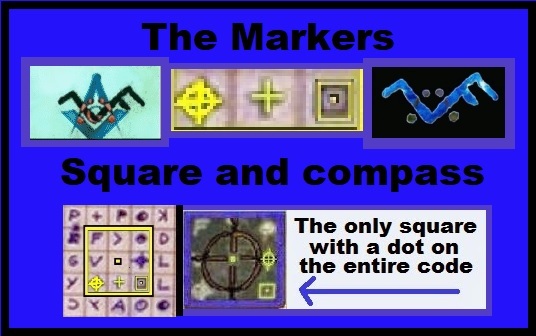 Also shows marking with dots and other symbols. 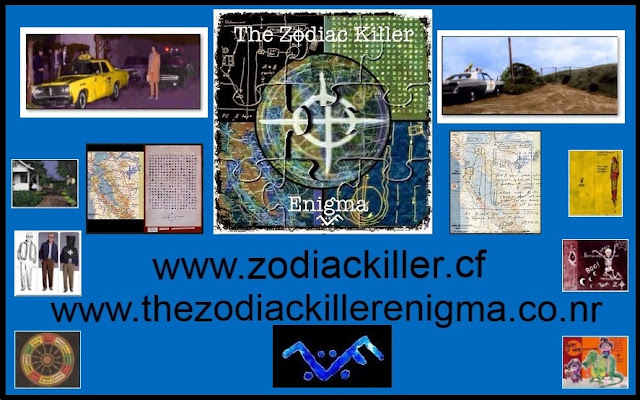 The Video below is something all Zodiac investigators should acquaint themselves with. It is a 1966 basic military map reading training video. It shows you things like the difference between magnetic north, true north, and grid north among other things. Why is this important? 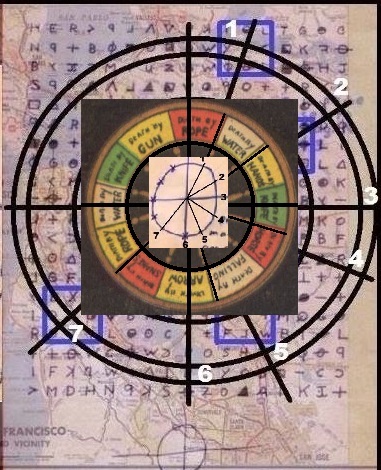 Well.......one of the things Zodiac sent that involves his codes was a map with the words, "is to be set to magnetic north" written in the corner of it above a compass. 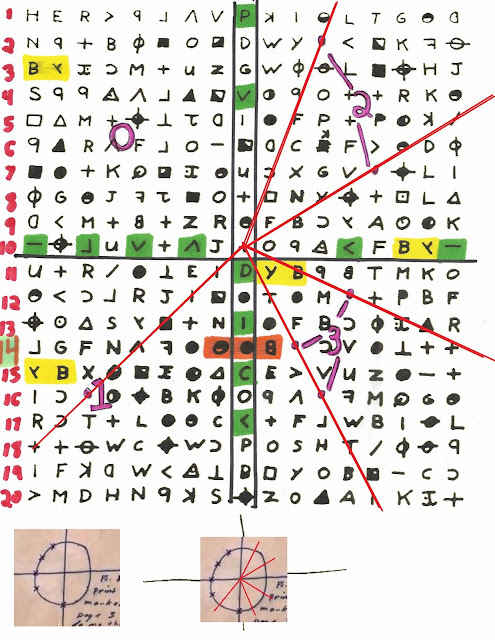 The Subliminal Secret of the Zodiac Killer Schematic (bomb and map overlay locations) very very promising. 9/21/2015- I just watched a movie made in 1988 called Bat 21. Itis a fictional story that is set in Vietnam. While the movie itself is fictional the way they used map overlays in Vietnam is based in fact. I laughed when the mp overlay and secret code they used with the map overlay in the movie was all based on golf and golf courses. It makes me wonder where they got the idea from for the film. Map overlays were commonly used in the military. I talk more about this in my posts. - a few hours later- Actually someone just informed that Bat 21 was not a fictional story and that the whole thing is based on true events that actually happened in the Vietnam War. Well..that makes it very very interesting indeed. The man behind it was named Iceal Hamilton, who went by the cal sign Bat 21. He was an Intelligence officer who was shot down behind enemy lines. I Eventually I will find out more about this. 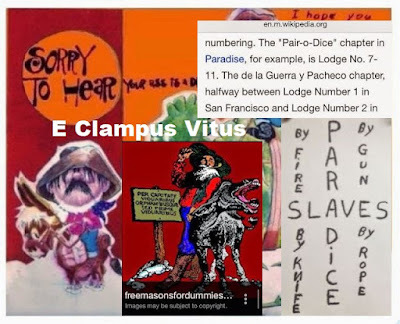 Does the Zodiac Killer have a connection to the E Clampus Vitus? 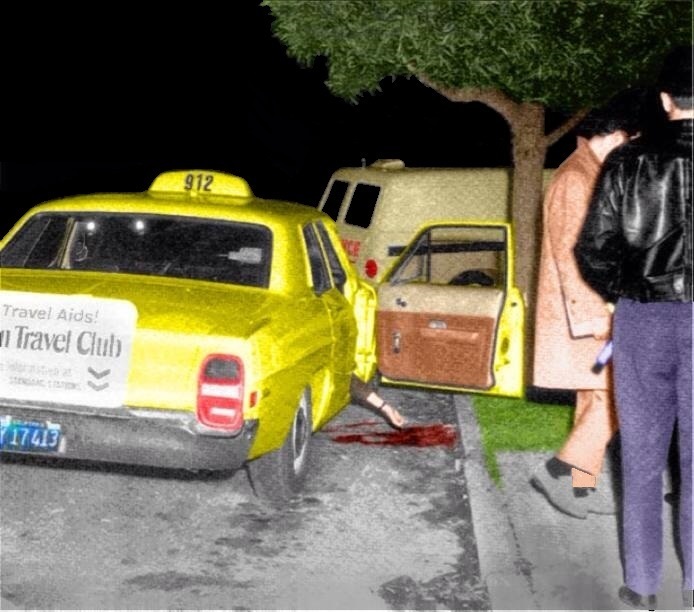 Did The Zodiac Killer Murder Susan Nason? 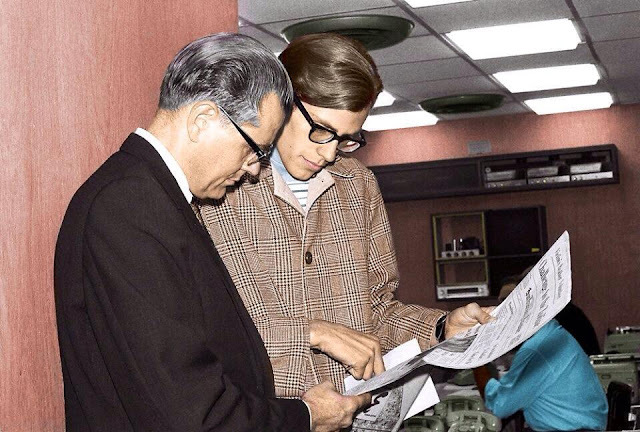 I colorized the original photo , and I have been doing some illustrations also. Above is one of them at the Bates crime scene. 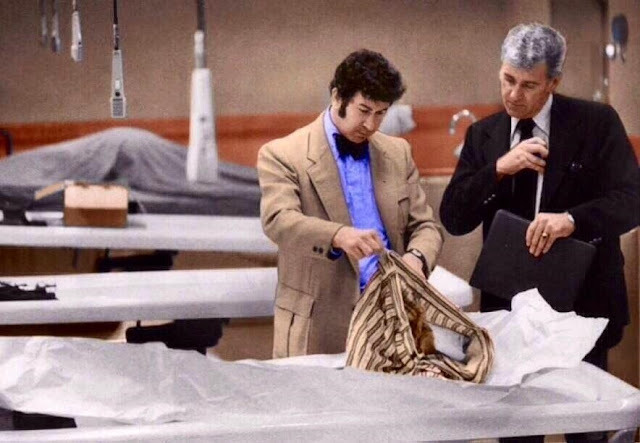 David Toschi and Bill Armstrong at the morgue inside the Hall of Justice in San Francisco. March 29, 1974. Toschi and Armstrong in the morgue at the California Hall of Justice in San Francisco. A have found a lot of things in the zodiac codes and letters that points to Masons or at least symbols and such used by them. I think as clues but where he got his influence from I don't know. Maybe he was a Mason maybe he wasn't. The whole society of Masons is built around King Solomon and his temple. In the initiation ceremony they all dress up and you act out the murder of Hiram who was stabbed and bludgeoned for the word of the master mason. On the very first page of the Holt comic it says , " legend has it this wheel was built for King Solomon". I never expected that. 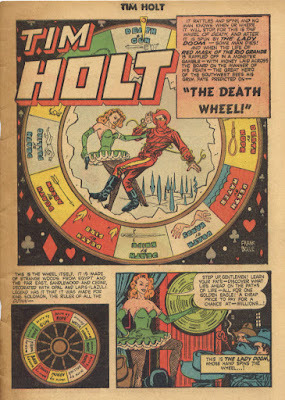 The link below take you to some interesting clips I found in all of the Tim Holt comics. I am searching them for more. I will be adding thoughts on them later. This will take a while but I a plan to do more work to it soon. I have time...the story is not going anywhere. and lots of other various things that zodiac displayed an interest in. A lot of this will come from a collection of 15 books printed in the 60's that came with World Encyclopedias that I had as a child. Things I have seen throughout my life that are like the things Zodiac did and made. One I want to find in particular is a second grade reading book we used at Caney Elementary School in the 1980's. I think the books were from the 60's or 70's. 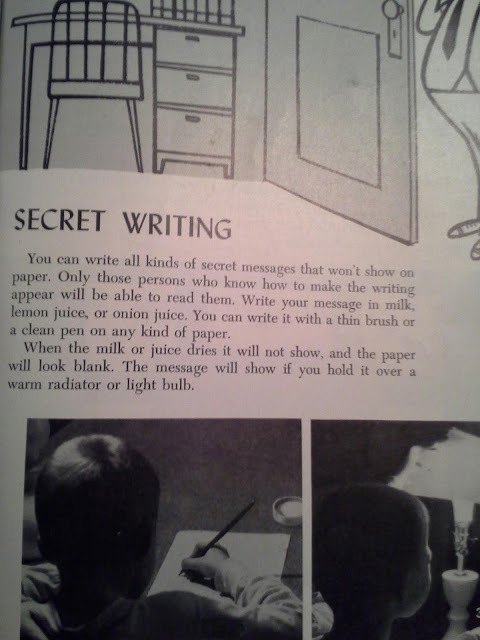 It gave instructions on how to making an overlay code but drawing boxes, hiding them in a picture , making a secret message in relation to those boxes then writing a false letter around your secret message. This is actually a known way of sending secret messages that you can google but I want that book to shows the exact instructions were printed in a text book for children. I was taught this in the second grade. Also when I was in that school I saw teachers using projectors to do things like how I believe Zodiac made his codes. I made an overlay box to demonstrate this. For now all I can do in accumulate information and list it. That being said I think you will find a lot of what I post very cool and interesting. I have a lot to post on this and it will take a while to do it all.